Five years ago, Bruce Robinson, of ODRINO, drove his well drilling rig up the mountains of arid Northwest Haiti to a remote community called Moulin. The people of Moulin currently had to walk either three quarters of a mile in one direction or one mile in another direction for water. However, these groundwater sources often recede in the brutal dry season. Bruce had a vision that the community of Moulin would have a water source that could provide safe, reliable water for the church and school in the area that desperately needed it. So, Bruce drilled and then he drilled some more. Over the course of one year, Bruce traveled to Moulin and drilled as often as he could, resulting in a 423-foot hole, and a prayer for a handpump that could reach that depth. In 2016, Design Outreach learned about Moulin and began working on a deeper reaching LifePump—the LifePump150. This new technology is designed for ultra-deep wells like the one in Moulin, reaching depths of 150 meters (approximately 500 feet). Covered well at Moulin, Haiti. May 2018. On Sunday, May 27, 2018, a team from Design Outreach traveled to Moulin, Haiti, and approached the 423-foot hole. 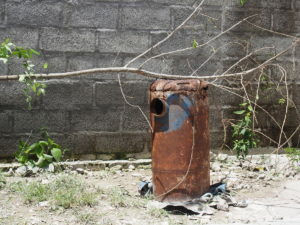 It looked abandoned: covered by a rusted well cover, wrapped with an old tarp, and guarded by a branch—which is the Haitian symbol for “don’t touch.” Deb Robinson said, “every time we come to Moulin, we pray over this hole. I’ve never prayed more over a hole, but this hole has been prayed over.” The team then prayed that by next Sunday, this seemingly abandoned hole would be home to the deepest hand pump in the world. 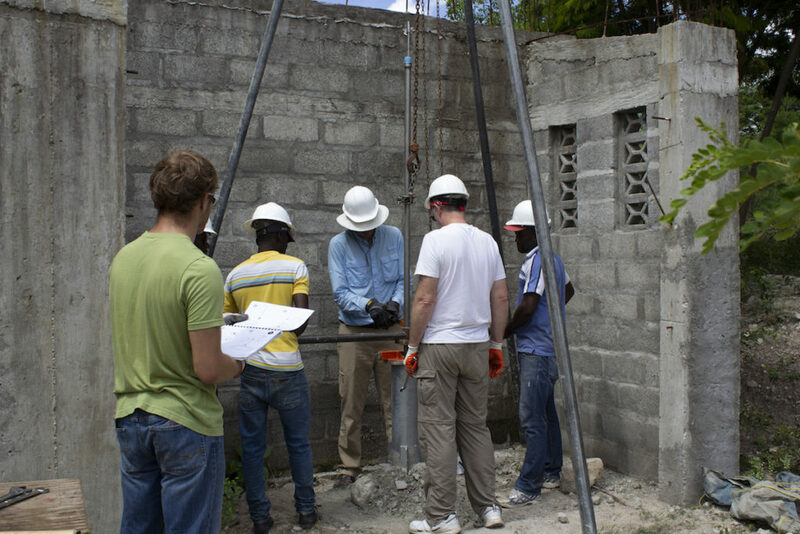 On June 1, every person began to work—Americans, South Africans, and Haitians alike, screwed on bolts, laid out pipes, set up the chain hoist, and lowered pipes into the hole. The rusted well cover became a seat for the team to take a rest, the old tarp was used to keep pipes off the dirt, and after 7 hours, the 40th pipe was lowered into the hole. Finally, the gearbox was placed on top. Bruce walked up to the pump and started rotating the handles. One of the Haitian workers, Clebert, took Bruce’s place as we waited with growing anticipation for the first drops of water to emerge. As Bruce put his hand under the spout, drops of water fell to the ground. Years of fervent prayer, devoted research, and new prototypes had led up to this moment. The LifePump150 was a success and an answer to prayer. Moulin Well Installation. June 2018. On Sunday, June 3, the church at Moulin resounded with songs of praise in Creole, French, and English. Pastor Bernex invited Greg to speak to the congregation. With occasional pauses for translation, Greg said, “Do not praise us for this water pump, praise God. He has guided our footsteps here and all the glory goes to Him.” After the service, the congregation surrounded the pump and prayed over it, just as many had done before. 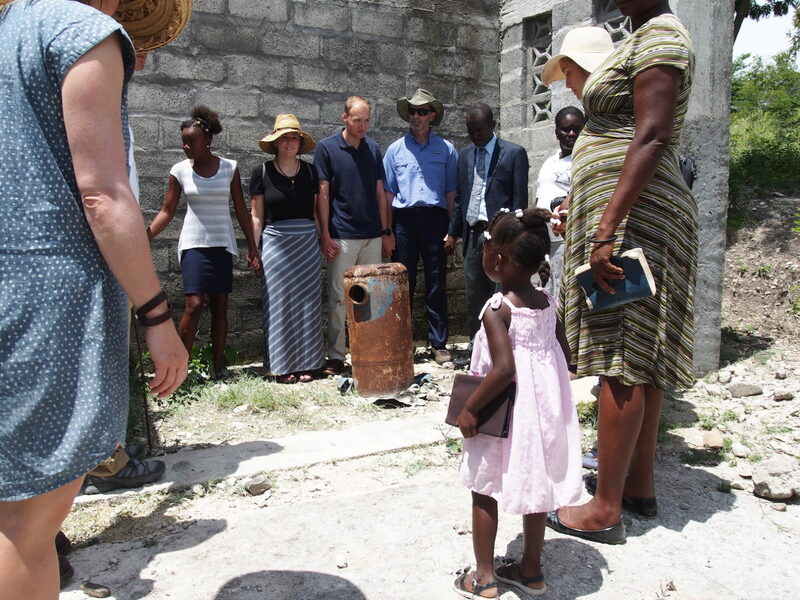 Children clung to tattered bibles and women held their song books as they watched Pastor Bernex and Jean, a member of the church, turn the aluminum handles—causing water to flow into a massive blue drum. You could feel the excitement in the air as children laughed and exclaimed to each other in Creole. Jean turned to a member of the Design Outreach team and said “Dlo se lavi,” which means “Water is life.” Indeed, it is, and this water will equip the church at Moulin to share about the Living Water that gives eternal life for years to come. If you are reading this as a Design Outreach supporter, a prayer warrior, or simply an advocate for making the world a better place, be encouraged to know that you were part of making this dream come to life. 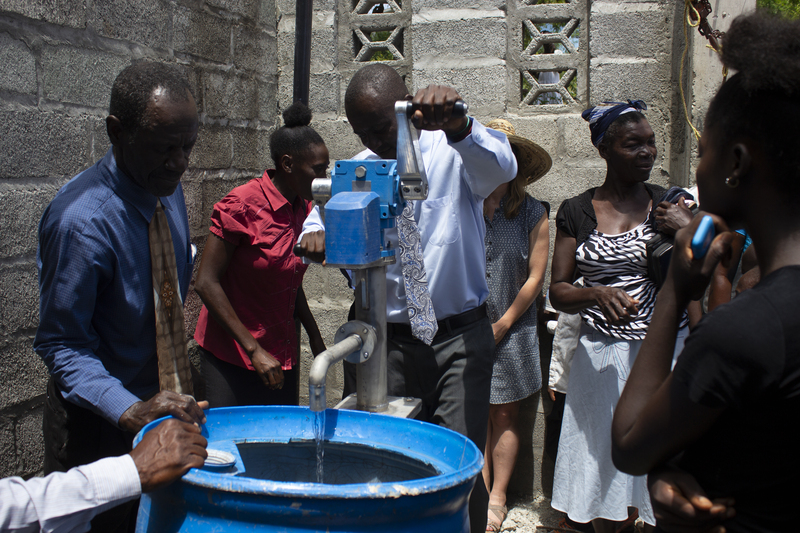 Design Outreach could not have installed the first LifePump150 in Moulin, Haiti, without the dedication of those who believe in our mission. With your continued prayer and support, we can transform more places like Moulin, Haiti, with safe and reliable water for years to come. Celebrate with us by making a donation today. Pastor Bernex at the Moulin well. June 2018. What an incredible opportunity to witness. Thank you for sharing! When I was in Africa last September I had the chance to see several Lifepumps, all in hot dusty rural areas. Reading a blog about these pumps is fine, but when I myself stood there, hot and thirsty, and looked around to see no source of water for……I have no idea how far, I really saw and experienced how a water pump makes a difference. The water pump is the slender vital link that takes a village of human beings from barely surviving to prospering. This is a great story, I love It!